Like millions of others, my wrist is almost always sporting a FitBit. I go through periods of time when I take the numbers it displays very seriously. But many times life gets in the way and this device is constantly collecting data that I ignore. But I was curious. Is there a pattern to my activity? Is it possible to predict how many steps I will have in a day? 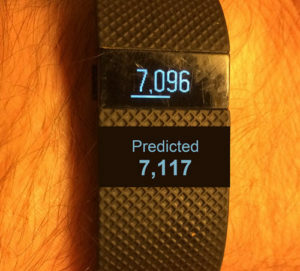 Why is it so hard to take a picture of your fit bit while you are wearing it and capture the number of steps displayed? Should I wax my arms? Fortunately, with my business I need to track a lot of things - much more than I had in the past. 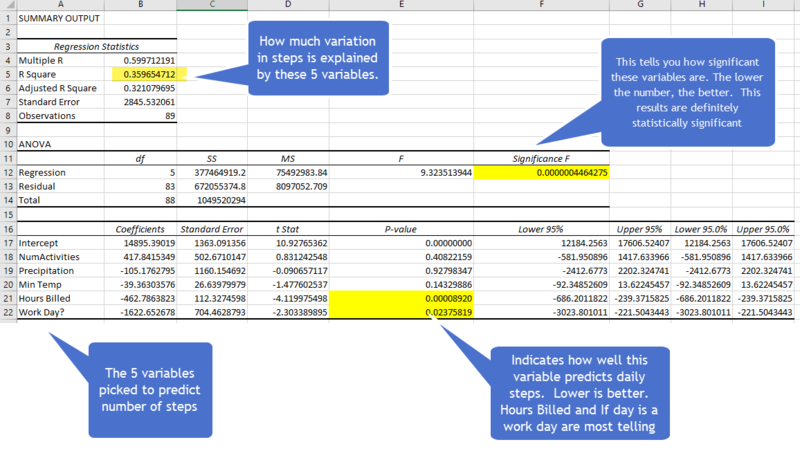 Armed with my curiosity and some data I have collected in Google Docs I got to work. Looking at the big picture, I am not doing too great at reaching my goals. What factors would impact how many steps I took in a day? My first thought was the day of the week. 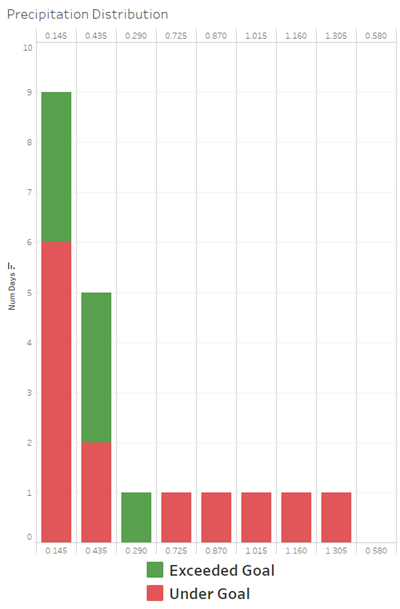 I put my data set in Tableau and with a few clicks I had my answer. Seriously? I looked at the days of week and my goal of 12,000 steps a day. 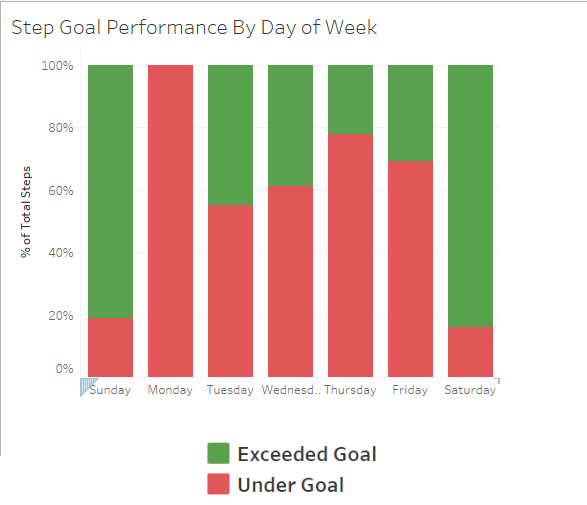 In 3 months, I have never once hit my goal on a Monday. Really? Nada. Zilch. 100% failure rate. Now that is an insight I could easily do something about. Saturday is looking much better as you can see - I hit my goal 85% of the time when the calendar says Saturday. This picture below tells you the story - me workie = me not stepie. I have been working in three locations this year - sometimes at home. Those days I have met my goal more often. Maybe its all those trips to the refrigerator and back? It was hard enough for me to meet my step goals, but when it rained it didn't help matters. There was some participation in 18 out of the 90 days in my study (20%). The Federal Agency National Centers For Environmental Information has lots of data available for free. This model only accounts for 36% of the variation seen in the 3 months of data. So it isn't going to work all the time. There are lots of other reasons that could greatly swing the number of steps I take in a day. While I was writing this, I decided to see how well it worked for the day. 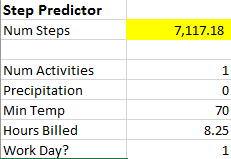 I was shocked at how close it predicted my steps using the 5 variables I selected. The formula predicted within 21 steps! A good analysis leads to action and a change in behavior. So what can I take away from this exercise? On days when I plan to work longer hours, take a walk / jog in morning BEFORE work.